A messenger RNA (mRNA) does more than provide ribosomes a template for creating a sequence of amino acids. It also conveys regulatory information, including so-called stop codons. But just as cars sometimes drive through stop signals on the road, ribosomes sometimes “read through” an mRNA’s stop codon, staying attached to the mRNA even though they have strayed into the mRNA’s 3′ noncoding region. Missing a stop may sound like pure dysfunction, but it may, according to an international team of scientists, be part of a previously unknown regulatory mechanism. A molecular biologist from Lomonosov Moscow State University together with foreign colleagues discovered a stop-stall mechanism that they call a “molecular timer.” It appears to control the number of protein molecules produced by a cell and prevents the generation of extra molecules. When activated with drugs, such a timer may help combat cancerous tumors. The amount of time accorded an mRNA molecule appears to depend on the distance between the first stop codon, which occurs at the end of the translated region, and a second codon, which occurs somewhere in the untranslated region and causes a ribosome to stall. 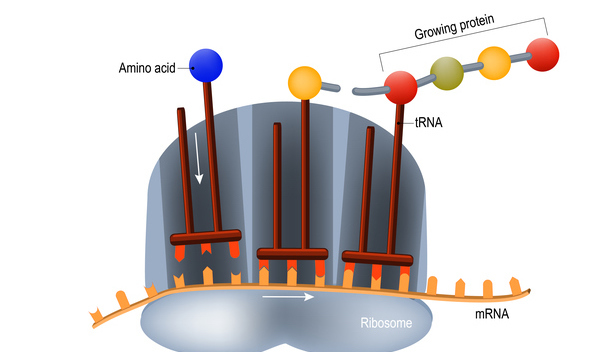 Behind the stalled ribosome, other ribosomes form a queue, which eventually reaches back to the first stop codon. When this happens, the mRNA can no longer be translated. The new finding adds to the growing body of knowledge about the ways noncoding mRNA regions regulate the life cycle of mRNA and protein synthesis. These regulatory functions are important because, depending on environmental conditions, a cell may need to alter the kinds of proteins it generates. Any regulatory abnormalities may cause uncontrollable protein generation. For example, deregulation of proteins in charge of cell division may lead to endless growth of new cells, which is characteristic for cancer. It should be mentioned that Amd1 has oncogenous properties. It has already been demonstrated that its excessive production in a cell may lead to the growth of very aggressive and metastasizing tumors. The team of scientists, led by Dmitry Andreev, Ph.D., a senior research associate Lomonosov Moscow State University, found out that approximately one in 60 ribosomes moves through the stop codon of the AMD1 mRNA, but after some time it stalls on the “wrong” sequence. The scientists also determined that the next ribosome that moves through the stop codon stalls behind it. The ribosomes queue until the line reaches the stop codon. As soon as this happens, the production of protein stops. If we learn to turn on the timer that regulates its synthesis (for example, potentiate the reading of the stop codon) with drugs, this may become a new therapeutic approach. Some medicinal drugs based on the activating of stop codon reading are already being developed, and one of them has been approved in Europe for treating Duchenne's muscular dystrophy. This story originally appeared in Genetic Engineering & Biotechnology News (GEN).